Pre-order the hottest 60Hz 4k monitor now! 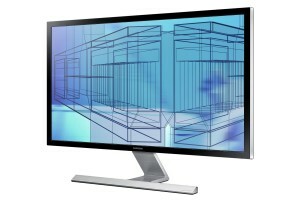 The long awaited Samsung 28″ 4k LED monitor is up on Amazon right now for Pre-order for $699. While there are cheaper alternatives out there, this is the first display that does 4k at 60Hz refresh (via DisplayPort) for less than $1000. As a developer, I can’t wait to see my desktop with all the extra real estate. It also comes with PiP with the two HDMI ports. Folks really seem to be excited about this, but I don’t see the draw on this feature, as I have many monitors on my desk. It is important to note that the HDMI connections are limited to 30Hz, so if you get this, make sure you also have a DisplayPort output to really take advantage of this thing. I just pre-ordered, and my estimated ship date is April 21. This entry was posted in Gadgets, News and tagged 4k monitor, Pre-order, Samsung on March 31, 2014 by David.